I'm taking a break from my house series for today to join in the Hodgepodge. Come back tomorrow for the next installment of the story of my house. I SOOOO agree! Where do I even begin with my summer memories? Playing "Kick the Can" and other yard games is high on the list! I like lasagna, for sure. I have a recipe for slow-cooker lasagna that I like. I prefer spaghetti, though. I haven't had a pedicure in an awfully long time, and I really miss it! A real company? Stella Artois. OR, a chocolate company. You brought me much sadness...arrivederci. I've been taking the opportunity this week to have lunch with my Daddy while I still can. After this week I won't be able to since school starts on Monday. We've had some good talks, and some sad talks. 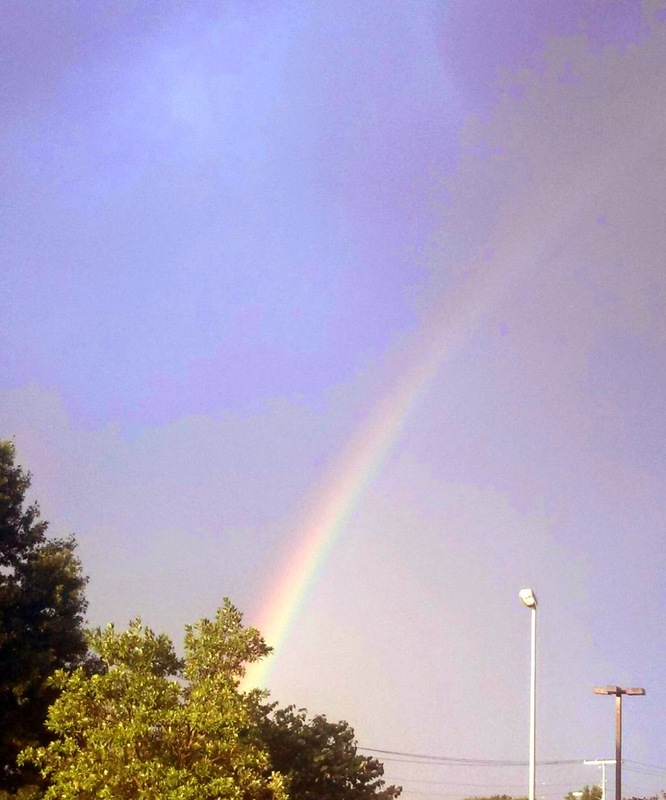 Below is a picture of the rainbow that appeared in the sky after the recitation of the Rosary. Unfortunately, we didn't see it because it was gone by the time we left the Funeral Home. A friend of one of my brothers was kind enough to send this to him. Beautiful sunset; you'll be surprised, there will be other things like this that will let you know God is walking with you through your grief. I am glad you have the opportunity to spend some time with your dad this week, Mary. That sounds interesting to make lasagna in a crockpot. It doesn't get too mushy? I always think seeing a rainbow during times of great sadness is comforting. A reminder that God keeps His promises. Thinking of you all! What beautiful rainbow! This is my first time to your blog, and I don't know what your sadness is caused from, but I will pray that you can work through it. I can't believe your school starts back on Monday! We have two more weeks- three until the kids come back. I am NOT ready. I'm so glad you're able to spend time with your dad. I know it means so much to both of you. Lasagna in the crock pot???? Please share! Popping over from the hodgepodge. Great answers! That slow cooker lasagna sounds amazing. Hope August brings you happier days. Are you sure you don't know anything about cars? lol I don't remember playing kick the can, but those nights all of kids in the neighborhood joined together for tag or hide and seek were the best. The rainbow is a beautiful promise (for our family it was cardinals). Enjoy the time with your dad and make some memories. I think rainbows are a sign of better times ahead. I am sure you will have them soon. It is wonderful that you got to spend some quality time with your dad. I agree with Betty. The rainbows and many other little things will begin to occur just when you need something to sooth you. I enjoyed your Hodgepodge!! Loved the rainbow. I got a picture of one that looks almost like this one. Enjoy your dad dates. They are what help me through missing my parents. So glad you are getting time with your dad before you head back to school. I never thought of a chocolate company. That would be a great one to be a CEO of. So sorry about your loss. May God provide comfort as only He can. I had chills about the rainbow... how amazing is that? How amazing is that rainbow!? I'm intrigued by crockpot lasagna too. I recently heard that you could do this.